While I receive a number of emails concerning things that I post on Pro Bono Baker, one of the most popular topics is Ting pop. I initially posted about my love of this pop when I reported on my yearly family vacation to Waupaca, WI last year. In an effort to assuage those of you who have written to me for more information on Ting, and for others who might be curious, I offer you all the knowledge I have. When my family is in Waupaca we always take a short bike ride, or an even shorter car ride, to the Weller Store in Rural. From Waupaca head southwest on CR-QQ which becomes Old WI-22. 22 jogs west in Rural and becomes Rural Rd. 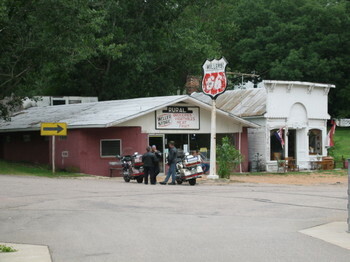 This should send you past the Weller Store which sits next to the Crystal River in Rural. A very sweet older man runs the Weller Store. (There he is above serving my father ice cream.) Here you can find water-logged pulp novels for 10 cents, Ting pop for a quarter, ice cream cones for the same price (50 cents for some premium flavors; I am fond of the maple nut), inner-tube rentals, and fascinating conversation about local lore, river water levels, and how the community has changed over the years. As far as I know, there is no way to contact the Weller Store. I cannot locate a local listing for it and I do not recall having ever noticed a phone in the establishment. While at the Weller Store recently, I learned that Ting is bottled by the New London Bottling Co. in New London, WI. They can be reached at (920) 982-2337. It sounds as if they will continue to bottle until they run out of bottles. Therefore, when you purchase a pop at places like the Weller Store you will kindly be asked to consume it around town and to return the bottle. Please do. It will be a sad day when I head to Rural and am unable to enjoy a Ting while watching the Crystal River canoe trips float by in the summer sun. Therefore, those of you looking to have Ting shipped or to take it home with you are out of luck. Please cooperate. Ting can also reportedly be found at Cheesie Bob's Bleu Cheese House in Waupaca proper. Follow the link for a map or contact the Bleu Cheese House at (715) 258-0900. AND for this fantastic link! 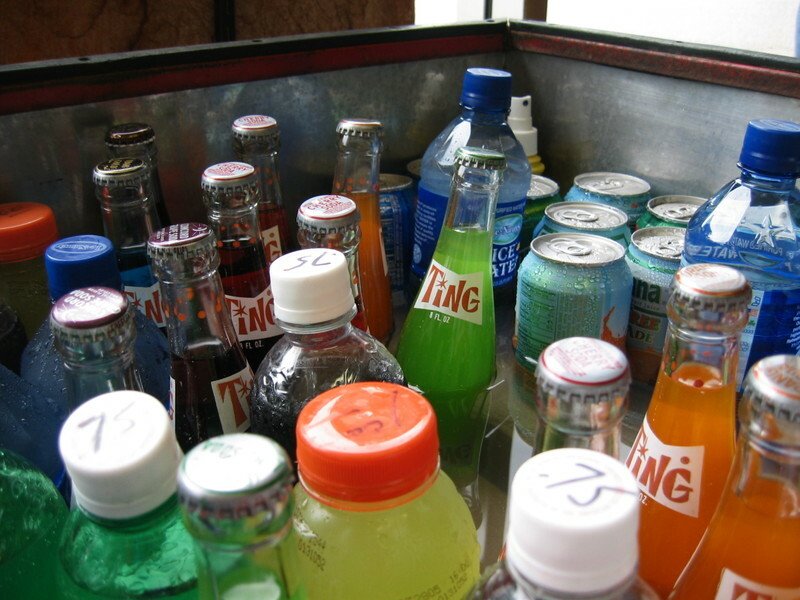 How could you NOT love a pop called Ting? The name is enough for me. Great entry! Just a note: Ting can also be found at Valley Liquor in DePere WI, but the owner confirmed that the company is running low on returnable bottles. I am wondering if some kind of cash infusion would buy them a few thousand more bottles! I love the stuff, and every single "kid-gathering" at our home is a direct run to the downstairs frig to grab some Ting. I think its made with real sugar...no high fructose corn syrup. 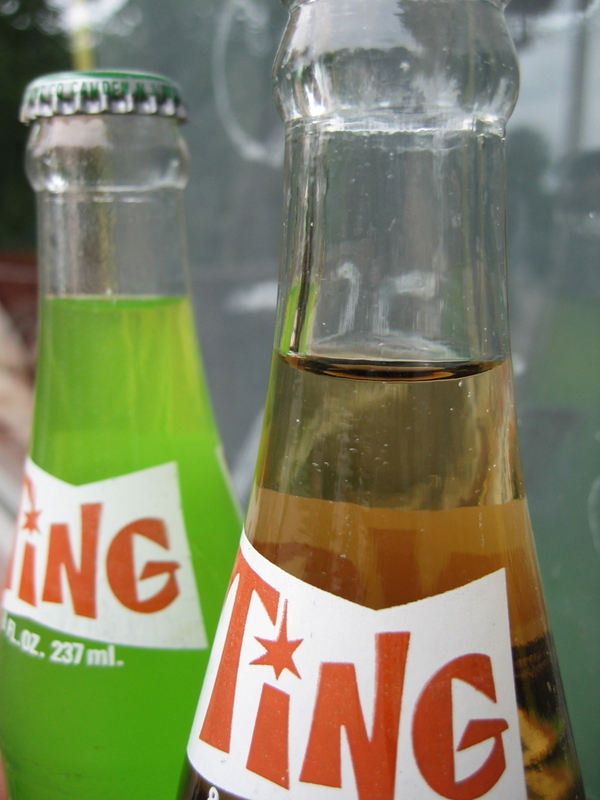 there is a soda in jamaica called "ting". it is grapefruit flavored and not too sweet, similar to squirt. Oh, TING! When I first started college in Appleton, WI we sold Ting at the campus coffee shop, and we would collect the bottles, presumably to be sent back to the company ... I don't remember if that ever happened or if they're still sitting around collecting dust, got recycled, or what. Wow. I had completely forgotten about that stuff. Nostalgia! We have a family reunion in DePere on Fathers Day for the Matzke Family and for well over thirty years ice cold Ting has been the favorite drink for Kids and Adults. I think we get it at the Valley liquor store, and we always return the bottles, but you have to be careful not to chip them with the opener. I just called the Ting Bottling Company they told me that Ting is still going to be made, and all rumors of closing are false. They guy at wellers lives down the road from the shop you can usally see him cutting his grass in the morning. His grandfather started the store then his father and now him. I found some of these bottles at a garage sale near my home. I picked them up because we call my Grandmother "Ting"!! Then looked you up! I would love to get some of this Soda Pop!!! I am so sad. I went to Cas's Liquor store and was informed that Ting is gone- no longer made and bottled. I asked for and did receive an empty bottle that I will put in a shrine to Ting. I grew up with Ting and had thoroughly indoctrinated my nephew and niece in the tradition of having Ting in the summer when they came up to visit. Now it is no more. The devastaTING news. Our visit is now TINGed with sadness. That's so sad! I was just up there and can confirm that Ting was no where to be found - Even at our old stand by Weller's. The end of an era indeed. The owner got hurt in Europe and had to stop making it. He now has it up and running again. We get it every year for our reunion. I had the bottling co. call me if it came back. They actually did! I just got word that Village Beverage in Slinger, WI carries it. I did call them to confirm. IT'S TRUE!! Please return any empty bottles! We want more Ting! That stuff rocks! We lived in the UP of Michigan and looked forward to our birthdays so that we could get a case of TING! Loved it! When I was young, back in the 70's, my family vacationed a few times in Iron River, MI. My fondest memory is Ting. The adults would go shopping and stock the fridge with Ting and me, my brother and sister and my 4 cousins couldn't keep our hands off the stuff. I remember some of the flavors having cool names. I only had Ting a few times in my life back when I was between 5-8 years old and I'll never forget it.